Please enjoy this Free Valentine dot to dot. Click the image to download the PDF. Read the directions. Print off the “easy” or “hard” puzzle. Fill in the To: and From: sections. Give it to a special someone for them to solve. This freebie is a sample of one of my Dottoo Dots skip counting number puzzles. These puzzles have a twist. If you don’t follow the pattern and skip over the extra dots, the picture doesn’t work. Learn or practice skip counting by 2s, starting at 1. Have fun and stay sharp. I recently posted instructions for a hands-on activity wherein the students make their own meter measuring tapes. I promised I’d explain how I’ve used them so far. Below is a description of ways to use the tapes to teach patterning. This will be followed in another post with ideas for using them with number sense and then, of course, measurement. Patterning is the act of analyzing the relationships between elements in a string of repeated occurrances of those elements. 😛 In this case, we are looking at the relationship between one number and the next after something has been done to that number. We can focus on the individual numbers, or on the change happening to those numbers. Have you ever noticed that your students can skip count, no problem, rambling on and on until they reach the biggest numbers they know? Have you noticed that they don’t actually know what 10+2 is, despite being able to count by 2s, or what 15 + 5 is, despite knowing how to count by 5s; they don’t actually know how these patterns are constructed or how they work? This is because they have memorized these patterns the way they memorize the lyrics to the latest Katy Perry song; they know the words, but have no idea what they are actually saying! To avoid this meaningless regurgitation, it is important to teach the students how the pattern works at the same time as teaching them the pattern. Better still, is teaching them about how changes happen in patterns and letting them figure out the different patterns that can happen because of those changes. Specifically, we can continually add on, or take off a fixed quantity, and say the new number we get, and eventually, we notice the same numbers happening over and over until we see a pattern. To accomplish this learning, the skip counting must be accompanied by a concrete understanding of the quantity we start with, the quantity being added, and the quantity that we end up with, and the students must understand that it is a recursive process wherein the quantity we end with becomes the quantity we start with. These measuring tapes (and any other number line example, such as thermometers, hundred charts, etc.) provide both a concrete example of quantity, and a way to figure out, check, and keep track of the pattern until it is memorized with meaning. With the students sitting in a circle, with their personal measuring tapes in hand, start at zero, and go around the circle, adding the number you’re skip counting by. As you go around, the children mark the place on the number line with their fingers, and they move to each new number in sequence as they hear it called out. If you followed my advice in the first post, and numbered only the 5s and 10s, then you should start the students practicing this activity with 5s. 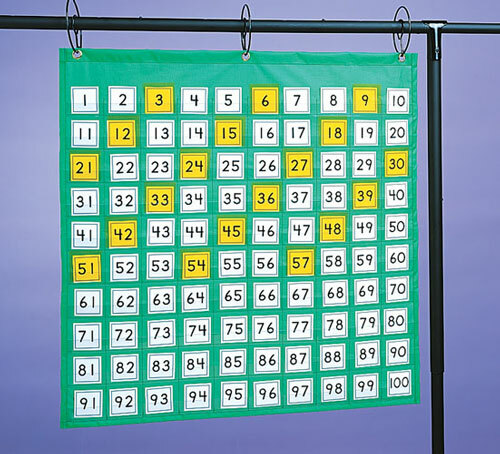 This will help those who struggle with counting, as the numbers are clearly marked. Then you can do 10s, noting that you skip the 5s. Then you can do 1s, easy because they should know the sequence orally, difficult because the numbers aren’t marked on the strip. The students will lose their places on the tapes. That’s fine. Once they hear the number that came before, they will be able to catch up. Either, they will be forced to go right back to the beginning and count out (because they haven’t yet realized that the number on the tape always represents the same fixed quantity), which is valuable practice, or they will, hopefully, eventually, realize it’s easier to go to the closest anchor of 5 or 10, and work out from there where the next number is. Follow the same activity to count by 2s. In Ontario, grades 1 and 2 have to count by 1s, 2s, 5s, and 10s, starting from a multiple of those numbers. Grades 3 and higher have to be able to count by those numbers from any starting point, and be able to count by other factors as well. It’s easy to adapt the circle counting activity by changing the factor being added, and/or changing the starting point. Using the tapes forces the students to figure out what comes next, by adding/subtracting the right amount to/from the previous number. This is better than just hearing the pattern and parroting it back. Also, as patterning becomes algebraic study in the later grades, the students become familiar with the recursive process, or the algorithm of skip counting (n=n+1), so the formula will have meaning when they eventually learn it. What concrete thing are we counting exactly? Make sure that the students understand we are counting centimeters, “the spaces between the lines.” This might require some groundwork on what centimeters are, in measurement terms. If centimeters are too abstract, use counters of some kind, small enough to fit between the lines on the tape. Place the correct number of counters, directly on the tape, with each new iteration of the pattern. There is a game played in the Junior grades where the players give a number to put in to the ‘machine’ and the leader gives the number that comes out (input and output). For example, a student says 5, the leader writes 10. A player says 10, the leader writes 15. You can use these tapes to figure out the algorithm for what happens to the input to get the output. By marking on the number line where the input is, and the output is, commonalities will reveal themselves, and a rule will be developed. The patterning in this case lays in the repeated operation. What is always happening to the number given to get the new number. Incidentally, this is an A pattern. +1, +1, +1, etc. is A, A, A, etc.. Essentially, any number pattern game you can think of can be done with these measuring tapes. If you have games you use to explore the numbers on 100 charts, you might be able to adapt them to these number lines, taking advantage of the linear nature as compared to the array layout of the 100 chart. If you have any other ideas for ways to use the measuring tapes to build number pattern knowledge, please share them in the comments below. How do you feel about number lines? Are they only for the weak kids? Do you use them in your math instruction? I never used to, until last year when I was discussing them with a colleague who’d been doing some extensive reading on early number routines to use in her grade 1 class. She told me about what she’d read, and how she’d been using these counting models with her students. By the end of the talk, I was sold. I had a grade 2 class, which is expected to count in various ways up to 200, and I always need to make sure I’m getting as much bang for my buck as possible. So, I took the concept of number lines, tied in the research I’d been doing on patterning instruction, and decided to bring in measurement, for good, ahem, measure. The project I came up with was to have the students make their own meter measuring tapes. This is a very rich, hands-on task that provides 100 repetitions to reinforce the length of a centimeter. It gives practice printing numbers and skip counting. And it allows for many opportunities for you and the students to assess and problem solve. Here are the instructions for how we made the measuring tapes, complete with cautions. In my next post I’ll share ideas for how to use them, and I’ll invite you to add your own suggestions too. 1. Prepare strips of paper that are over a meter long. You can do this with lengths of cash register paper, or by cutting strips of bristol board, about 5 cm wide. You’ll need to cut the bristol board sheets width-wise, and tape or glue two short strips end to end to make one strip that’s long enough. The bristol board will be sturdier and less likely to tear when the measuring tapes are being used. And besides, we have about 500 sheets of pink that no one wants to use. 2. 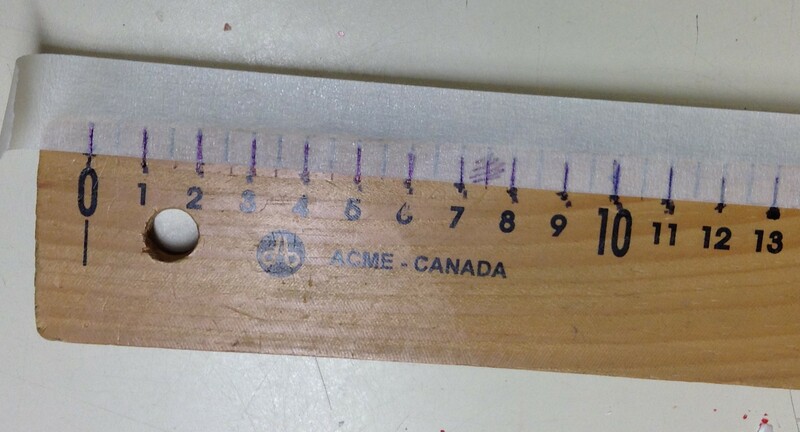 Run a line of masking tape along the edge of a meter stick, leaving a portion of each of the centimeter marks showing. You should do this if expedience and materials are factors. Straight taping is not the goal of the lesson. Be thoughtful about how you’re placing the tape. If a particular student is a bit “rough” with her things, don’t let the tape hang over the edge, or it will be twisted, bent and torn before long. And, a word to the wise, if the meter stick is also broken down into half centimeters and millimeters, cover these marks entirely with the tape so that only the centimeter lines are showing. Otherwise, some of your more industrious and less attentive students will mark every single dash on the ruler. I promise that some students will skip dashes. Others will do all the millimeters anyway, because they can still sort of be seen through the tape. Whatever the error, each is an opportunity to reinforce the concepts of centimeters and standardized measures. I.e., Dashes that are closer together are smaller than a centimeter. Missed dashes mean that there are some spaces that are more than 1cm long. Not following the dashes exactly means that some “centimeters” will be bigger than others. If an error happens, it will be better in the long run to pull the tape off and start again. Otherwise you’ll be dealing with those stray, scribbled out lines every time the student tries to use the ruler. But keep note of the mistake for your records. 4. Once you’ve checked all the dashes, peel the tape off the ruler and stick it down the center of a prepared paper strip. Don’t pull the tape too taught, or the whole thing will curl. If the tape tears, just carefully place the two ends together on the paper strip. You’ll never notice. 5. Have the student mark the desired numbers under the appropriate dashes, along the paper. will miss a number, repeat a number, print the numbers backward or in reverse order, or partition the numbers too close or too far apart. IF they write the numbers on the tape first, you will have to redo the whole dash process as well as fix any number situations. This process is an excellent opportunity for you to assess and remediate your students’ number knowledge. You can consider having them use charts or exemplars in the room, or on the actual meter sticks, to find and fix their errors. For example, rather than saying “your fives are all backwards,” you could say “you made one kind of number backwards every time – see if you can figure out what to fix.” If you’ve pre-questioned the child about how many dashes she had to draw, and she’s written “100” five dashes too early, question her about why she still has five dashes left. 6. Transfer the numbers to the tape. After you have confirmed that the numbers were all written properly, in the right order, with the right spacing, it is now just a matter of the student copying the correct numbers onto the corresponding places on the tape, using the correct numbers on the paper as the guide. Note, that one or two students might start from scratch, missing the whole point of writing the numbers on the paper first. Does anyone come to mind? 7. Put each child’s name on the tape itself as they complete the work. Make any notes about their knowledge or learning in your mark book. Then cut the tape away from the paper strip. You might want to do the cutting yourself, unless you are very confident in your students’ scissor skills. Here are some points to consider when making these. Decide what increments you want the students to use. Last year I had them do it by 1s. This was very time consuming, it was not easy for the students with poor fine motor control, and there were a lot more errors. This year I had them work by 5s. This gave me the chance to see who could count by fives (three could not), and I have the added advantage of forcing the students to think in terms of anchors of five and ten when they use the rulers in the future. Some students will need a lot of hand holding, either due to physical or intellectual issues. Anticipate who these students are, ahead of time, and allot time accordingly. Make a couple of extras in case a tape gets damaged when you start using them. Check back for the next installment where I tell how I’ve been using these tools. This is a note I post for parents who use my class website. Please feel free to copy it and share it as you wish. Reading chapter books is different from reading picture books. At the heart of it, there are two reasons to read fiction: comprehension and entertainment. To help your child/student understand and enjoy chapter books, there are a few things to think about. First, chapter books are more complicated than picture books. Many picture books are simply concept books. This means there is no story. There are just some ideas about a topic, like counting or feelings. Chapter books are almost always stories, and the reader has to know how a story is put together. So, the reader has to know about the setting, the characters, and the time. The reader also has to know about story beginnings, middles, and ends. As well, in chapter books, the problem and solution part of a story is very important, and it takes much longer for the problem to be fixed. Many chapter book series are quite formulaic, even beyond the typical progression of the story arc in a novel. Beginning and reluctant readers will often latch onto a series because this familiarity makes reading each successive book easier. Second, there can be two stories that happen at the same time. This means that there are two problems to think about, and sometimes two main characters. Keeping these problems straight can be hard for people just starting to read chapter books. Third, the length of a chapter book needs good memory skills, so that the story events and details can be remembered for the whole time it takes to read the book. Fourth, depending on the book, there can be a lot of extraneous, superfluous, and diverting information that the reader has to filter through. The more descriptive the writing, the more outside of the reader’s experience, and the more purposely obtuse details (in the case of mystery and suspense), the more difficult (and one might argue more enjoyable) the read. The increased complexity and depth of chapter books makes them a challenge, but the plot complications, older subject matter, and rich language make them an experience for all young readers to aspire to. And each experience makes the next one better. Here are some tips for kids reading chapter books. Talk about what you are reading as you read. When you talk about your reading, you give your brain extra practice remembering what happens. This will help to keep the whole story in the memory for the whole time it takes to read the book. Visualize (picture) the characters and setting as you read about them. The pictures will help you remember these important parts of the book. As you start each chapter, think about what you read in the chapter before. This is really good if you have just picked the book up again after a break. If you can’t remember what happened before, reread the last few paragraphs you read, to remind you. Make sure you understand what is happening. Books are supposed to make sense. If things don’t make sense, you probably read something wrong, or remembered something wrong (or you’re reading a badly written self-published book – or a badly written professionally published book authored by a “celebrity”). Go back and reread the part that is confusing you. If that doesn’t help, reread the part that makes you think the new part is confusing. For example, if you read a part that says your character is angry at his friend, but then you read a part where he and his friend are happily playing together, maybe you missed something, or misunderstood something you read. Read both sections again, to figure it out. Always remember that the character has a problem to solve. If you think about that problem and how everything that is happening helps to solve the problem or makes the problem worse, the story will be easier to remember and more enjoyable to read. In Ontario, there are five math curriculum strands that must be covered each year in elementary school. Of the five, I always gave patterning short shrift. I never really understood why having the kids make strings of red, yellow, and blue beads was relevant, and it was usually something I left to the last minute, or something I had the kids do while I assessed students or worked with small groups on “important” math. Then, last year, I decided to find out more about it, and this past May, I presented my research and exploration of patterning at the Ontario Association of Mathematics Educators conference in Toronto. Unfortunately, I only had about 70 minutes, which, judging by the saucer eyes I saw staring back at me, was only enough time to turn my workshop participants on their heads and send them out the door, walking on their hands. Therefore, over the next few months, I’d like to use my blog to go into more depth and engage in some discussion about what I’ve learned and the activities I’m developing. The first thing I want to share is my list of what I consider to be the big ideas that students should learn about patterning. These are compiled and cobbled together from the NCTM standards, readings from Van de Walle and Small, and research by Joanne Mulligan. I have no idea, anymore, which ideas are theirs or mine, so lets just assume it’s all part of a Jungian zeitgeist and carry on. These are some pretty big ideas indeed, and they seem a bit too grand to be achieved by stringing beads together. They are very likely not something most primary teachers keep in mind when chanting “red, yellow, blue, red, yellow, blue” with their students, during calendar time. But as I post, I will endeavour to always refer back to these ideas, and we’ll see what other, perhaps more effective ways there are to discover and explore them. More to come. The first theme from Brockman’s collection of intelligence-fostering essays, This Will Make You Smarter, is that we would all be better off if we saw the world the way a scientist does. There are three essays in particular that extol the objective processes of the scientific method and experimentation as the procedures for doing everything, from allaying irrational fears to overthrowing fascist governments. Full disclosure, so that you’re not changing the entire way you think based on my interpretation of a small data set. These essays are all very short, and are not to be considered exhaustive. But, they do encourage a lot of deep thinking and reflection, in me anyway. 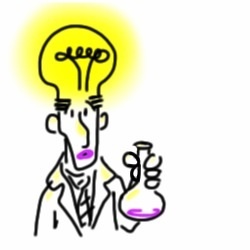 This essay is about following the scientific method to make decisions in our lives. Hannay asserts that we are too quick to judge, and those judgments are based on prejudice, preconceptions, and a lack of imagination. According to him, we should be striving to be more objective and data driven, rather than going by some introspective gut feeling, or asking around to see what others think. I believe that his assertions are based on data collected in controlled experiments, but I only have his word for it. Dawkins is of a like mind, but twice so. I will infer he has been reading the same journals as Hannay. He wants us to be critical. He also thinks we need to be more objective in the face of personal opinion, because of the bias inherent in it. He wants us to stop generalizing from a handful of anecdotes, in favour of coming to conclusions based on evidence. For him, it all comes down to improving the population’s understanding of how controlled experiments work (specifically, I believe, how they filter out as much bias and external influence as possible, ensuring that true causality is established), so that we develop a healthy, habitual skepticism that will keep us from being tricked or lied to. In this entry, Tegmark laments the “fact” that scientists are pretty much useless at getting their message out to the public, and that, when the message is disseminated, it has often been watered down, misinterpreted, or bastardized (I’m generalizing here, but HELLOOO, every last initiative in education I’ve seen in the past 15 years). He laments this because so many of the decisions we make in our lives are based on inaccurate and incomplete information. He believes we are too busy, too biased and set in our ways, and too overwhelmed by the volume of information available. I’m going to add too skeptical of things we think will make our lives complicated, boring, or inconvenient. My purpose behind this blog entry is to explore how these ideas might influence me and my pedagogy. What would be the result of teaching students about controlled experimentation and critical thinking? Shall I question the authority of these experts before I make any decisions? Visions of riot shields and fire hoses come to mind when I think about challenging authority. Is that what these folks mean? Do they mean rebel against authority? Don’t trust anyone over 30? I don’t want a child to touch the stove because he’s been taught to be skeptical of me when I say it’s hot. I don’t want him to find out on his own. Or do they actually mean to question authority? Well heck, I do that all the time. Questioning is not necessarily the act of open rebellion some politicians and other community leaders make it out to be. It is just the act of asking questions. “Why is that the case? How do you know? Based on what evidence? Have you considered other data? Which ones?” I don’t really have a problem with this, as long as I have substantiated responses to provide. And as long as the student isn’t just questioning for the sake of being a disturbance, and can provide her own evidence to the contrary, if necessary. Anyone who does question can certainly be given the opportunity to find out the answers for himself, through research and experimentation. I’m comfortable with this, because I’m fine with finding out I was wrong. Which brings me to an idea these writers have not touched upon, but I believe must be pointed out. If we are going to question others, then we must also question ourselves. Riot police are called out when two factions of self-righteous people clash. But, those who scream that they know better than the authorities inevitably end up authorities themselves, with their own violent detractors to repel. Humility and openness to others’ skepticism seem much more productive than arrogance and close-minded certainty. When we experiment, we suppose. We are bound to find some of our suppositions were wrong. In the end, I agree with these three arguments, and yes, to acknowledge my bias, this is mostly because they match my experiences. But, when I say experiences, I mean from both perspectives. I have been on the receiving end of ignorant dictates (from several education ministers and their leaders since ’95). And, I have been guilty of an unbending, near-sighted hubris of my own (Dear Editor). I’ve made myself the authority and then been challenged because of it (Literacy Coach). I’ve challenged and been shut out. I’ve lead the charge, only to find myself the first to bare the brunt of a counter attack (Facebook Page). If I choose to see those experiences as experiments, then I can look at them objectively. I can question myself and decide how to conduct the next experiment better. I can assess for bias. I can restrict parameters. I can gather data. I can learn. I can use that learning to question. I can use that questioning to teach. 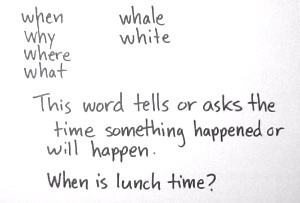 This entry talks about a method I developed for using flash cards to teach sight words. If you want the background and justification for this method, please read Part 1. While working with my struggling readers, I made a few observations. Nouns and verbs are easier for them to learn than other kinds of words. The more abstract the words, the harder it is for these students to learn them. By abstract, I don’t mean Cubism or Dadaism, though those are pretty hard to get your head around. 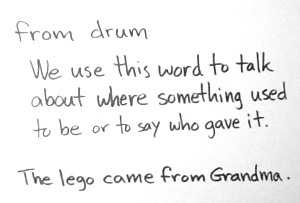 I mean pronouns, and adverbs, and the words we, as adults, would have trouble defining. Give it a stab. Try telling yourself what the word ABOUT means. How about OF? Anyway, when my students have no problem recognizing the words PENGUIN and NINJA, but can’t tell if they are reading IT, AT, IF, or IS, then I think it’s clear that the nature of a word holds sway over the ease of its acquisition. To this end, I designed my flash card program so that the meaning of the word and its role in a sentence are given just as much importance as the look of the word. Three things to learn instead of one, yes, but three things that put the word into context, and allow for connections to be made beyond the dolch word list. To make the flashcards, here’s what you do. Now, on the back, write examples of other words that have a similar phonic structure, or make a note about the exceptionality of the word. 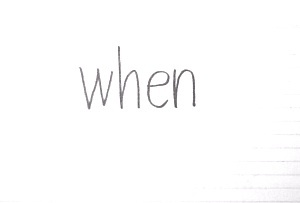 For example, you might note that the word WHAT starts the same way as other questions words like WHY, and WHEN. You could also note that the H is silent, and other words like WHITE and WHALE have a silent H.
The next thing to do is write a definition of the word. A good definition will explain what the word means, and how it works in a sentence. It will convey the purpose of the word. This is the REALLY difficult part, because you don’t want a dictionary definition. You want something the student can relate to and understand. And don’t use the word itself in the definition! And last, you have the student come up with a sentence that uses the word. 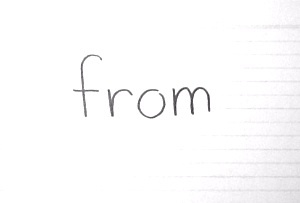 Write this sentence on the card, highlighting the word. It is important that your student makes up these sentences. First, because it will immediately tell you if he has any concept of the word – of course he won’t be able to read the word if he doesn’t even have it in his lexicon. Second, the sentence will be something he can connect to, so he can access his schema later. Third, it will be at his vocabulary and grammar level. Fourth, there is a current way of thinking that says students should encode before we ask them to decode. This is encoding at the sentence level. Keep in mind that these are intended for use with students who need remediation. You can certainly use the methodology in a whole class lesson, but the cards themselves are too involved to have a class set, especially since they include generating personalized sentences. Now, let’s use the cards. First, see if she can read the word when she sees the front of the card. Then, flip it over, and discuss the spelling of the word. Point out the features, exceptions, and similar words. After several visits to the card, see if the student can recall the spelling pattern on her own, or if she can read the other words you’re associating. Next, review the meaning of the word and how it’s used. Again, see if the student can eventually define it herself. It’s okay if she just gives an example of its use, rather than a definition. Remember how hard it was for you to define them when making the cards. Last, have the student read her sentence from the card. Have her point to each word though, so she isn’t just parroting her words. You can make a new sentence later, if you need to use the cards often. Run through several cards repeatedly, over days. As the student becomes more familiar and shows that she has memorized the appearance, features, and use, you can move on to new cards. Remember to revisit old cards to reenforce the learning over time. Now, I can’t guarantee that this method will work for all students, and students with severe learning disabilities may not benefit from this at all. But I have had success, especially with children who do not learn grammar patterns through osmosis. As always, you will have to try the method, give it a few weeks, and then test to see if it’s working. If you try this out, please let me know how it went. If you came up with any tweaks, or have a particularly good definition for one of the trickier abstract words, please share.